On January 16, 2008, Clint Eastwood filed a lawsuit in the U.S. District Court for the Central District of California against Palliser Furniture, Ltd, Palliser Furniture Corp. and several John Does (together “Palliser”) over a line of home theater chairs manufactured and sold by Palliser under the name “The Eastwood.” See Clint Eastwood v. Palliser Furniture, Ltd et al, Case No., 08-CV-00266 (C.D. Cal.). A copy of the complaint (courtesy of TMZ) can be downloaded here. Eastwood’s lawsuit follows a similar lawsuit against Palliser filed in the same court on November 20, 2007, by the Executors of the Estate of Marlin Brando. See Morris Medavoy, et al v. Palliser Furniture Ltd., et al, Case No. 07-CV-07595 (C.D. Cal. November 20, 2007). At issue in that case is a similar line of home theater chairs made by Palliser named “The Brando” (apparently now renamed Sequelle). A press release from the Marlon Brando Estate regarding the dispute can be read here (although it should be noted that the press release discusses the filing of a lawsuit dated March 23, 2007, and may be referring to an earlier court action that apparently was unsuccessful because otherwise, why would the Marlon Brando Estate be pursuing a similar action in federal court eight month s later). The complaint sets forth three causes of action: 1) false designation of origin and false description under Section 43(a) of the Lanham Act (15 U.S.C. §1125(a)); 2) violation of Eastwood’s right of publicity in his name in violation of California Civil Code §3344; and 3) common law violation of Eastwood’s right of publicity in his name. Eastwood claims that Palliser’s use of the name “Eastwood” on its chairs will create a false impression that “The Eastwood” home theater chairs are endorsed or associated with Eastwood and constitutes a misleading description of Palliser’s goods. Eastwood also alleges that Palliser committed such actions willfully in order to trade off of Eastwood’s reputation and goodwill. Eastwood further claims that Palliser’s intentional use of the name Eastwood is causing harm to his name by being falsely associated with Palliser’s home theater chairs. In addition to injunctive relief, Eastwood seeks the usual damages under 15 U.S.C. §1117(a) (Palliser’s profits, damages, and costs) and also maintains that Palliser’s willful conduct makes the case exceptional entitling Eastwood to treble damages and attorney’s fees. Eastwood also requests damages, attorney’s fees, and punitive damages under California law. Eastwood unquestionably has a strong mark in his own last name, especially with goods and services that are related to the movie industry (although one should note that there are many registrations for the mark EASTWOODfor other goods and services such as guitars and insurance brokerage services as well as a multitude of goods and services across four registrations held by Easthill Group, Inc.). 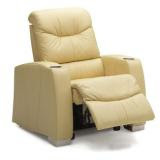 In addition, the goods are related albeit tenuously – Eastwood’s name is commonly associated with the movies and the goods at issue are for home theater chairs (no doubt purchased by movie fans). And to the extent that Palliser named its chairs “The Eastwood,” then the marks are similar – although if you click on the above links, you will note that Palliser appears to be changing the name of its various lines of chairs and moving away from “The …” celebrity names (see also here). I do question whether the relevant consumers in this case – wealthy homeowners with home theater systems – would honestly believe that these goods (home theater chairs) are truly endorsed by the individuals after which they are named. In addition, home theaters are not cheap – consumers purchasing these chairs are likely to exercise a high degree of care. They will select a chair based on its features – and not because of the “movie actor” after which it is named. The names of these chairs would be recognized by such movie-fan consumers as playful references to famous movie actors – not as an endorsement by those stars. In addition, I doubt that either Eastwood or Brando’s estate is going to be branching out into home theater furnishings anytime soon (although Brando’s estate does have a trademark application for THE BRANDO pending for towels, spa products, and clothing, which was recently published for opposition). While Eastwood may be able to unearth evidence to the contrary, it would seem that Palliser’s intent in choosing to name its movie theater seats after famous movies stars was not to take advantage of the goodwill in Eastwood’s name, but rather to appeal to the interests of movie aficionados (Palliser’s primary customers for such seats) who are likely to be fans of such great actors as Marlon Brando, Clint Eastwood, James Cagney, and Sean Connery, but who are not likely to buy a particular theater chair simply because a particular celebrities name is tied to it. So while I would like to believe that the factors tend to favor a finding of no likelihood of confusion, I recognize that Eastwood asked for a jury trial for a good reason, namely so that Eastwood can make such arguments before a group of jurors who will certainly have heard of Eastwood and who may be more easily swayed into finding a likelihood of confusion under the circumstances. As for Eastwood’s right of publicity claim, Palliser did knowingly use Eastwood’s name on its products without Eastwood’s permission and did so in part to take advantage of the Eastwood's movie actor, which doesn’t bode well for Palliser. However, California Civil Code §3344(e) does provide an exception for the use of a person’s name without such person’s consent even though the use is commercially sponsored. Of course, it becomes a question of fact (for the jury in this case) whether or not Palliser’s use of the name “Eastwood” was “so directly connected with the commercial sponsorship” as to create a use for which consent is required. Of course, the above assumes that this case even goes to trial, which I can’t imagine to be the case given the steps Palliser is taking to move away from such allegedly infringing use actors’ names for its chairs. More than likely, the parties reach a confidential settlement whereby Palliser agrees to stop using the name and possibly pays some monetary compensation for past infringing use (perhaps a donation to Eastwood's favorite charity).